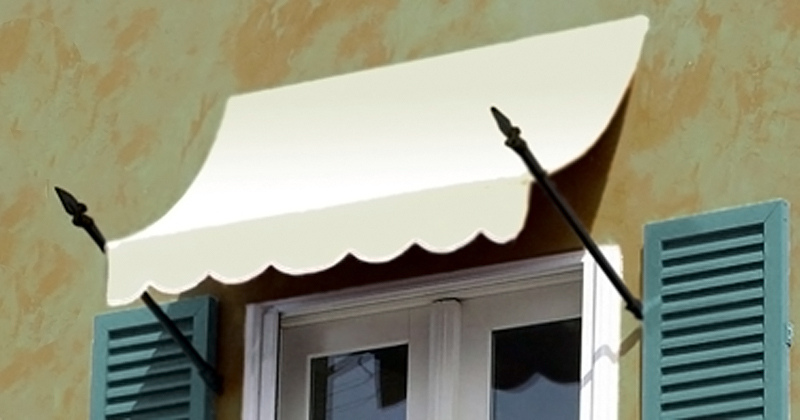 Beauty Mark New Orleans Series designer styled spear supported window awnings intended to function as either a window awning or door canopy. This awning has the choice of valance styles the scalloped edge providing a classic style with the straight edge valance providing a more contemporary look. If ordered with a larger projection this awning can also function as an attractive door canopy. The New Orleans Series awning uses the Beauty Mark awning fabric and is available in fifty different color variants with solid as well as stripes being available for this model. All seams and thread utilize an ultra strong U.V. resistant thread versus a polyester core thread that is more susceptible to deterioration. The fabric is mounted on a structural aluminum frame that provides a no rust barrier to the fabric with the spear supports incorporating powder coated steel. The fabric itself is designed to be U.V resistant as well as mold and fade resistant and has a five year factory warranty on the fabric and frame. Aside from all the quality constructed features of this contemporary attention-grabbing fabric awning you will also reap the benefits of reduced heat, protection from fabric fading and U.V. rays and gain an attractive home accent that will help increase the overall value of your home.